Note: Yes, I went by the nickname of Chuckie as a kid. No, we won’t mention it again (unless I need another pithy headline and it fits). I’ve never really thought of myself as a “big guy.” To be sure I was a bit tall as a kid, but so scrawny that “big” never described me. When I got to high-school I was 6′1″ and while a bit doughy at 185 lbs I was still not “big.” I started exercising a bit and quickly dropped down to 140-145ish though most of high-school. A few years later when I got married I was a bit above 6′2″ and around 165 lbs (still pretty thin). 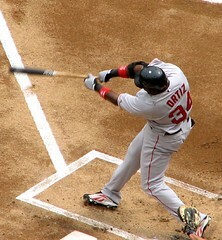 Over the years I’ve packed on a few pounds here and there (more than a few apparently), and when I was looking at some baseball statistics I noticed that the given size of David Ortiz (aka Big Papi) of the Boston Red Sox (I was comparing batting stats for DH and first basemen) is 6′4″ and 230 lbs. Well, I’m an inch or two shorter than that… and about 5-10 lbs heavier than that. Wait, I’m BIGGER, than Big Papi!?!?!?! I’m certainly not as beefy as he is, but I may have to re-assess my own body image as that of a larger man than I’ve always thought of myself.